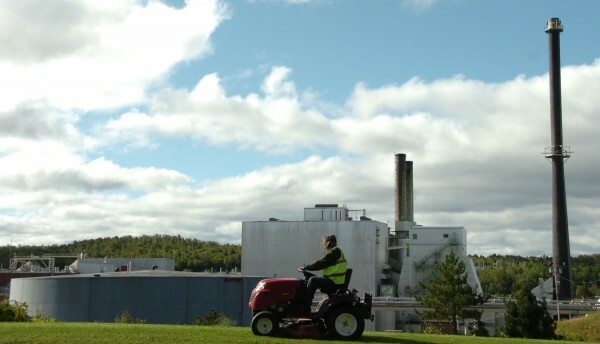 A town worker mows the Main Street median in front of the shuttered East Millinocket paper mill Friday morning, Sept. 16, 2011. This mill and the one in the Millinocket were purchased by New Hampshire investor Cate Street Capital on Friday, Sept.16. EAST MILLINOCKET, Maine — Ever since the town’s paper mill closed in April, Mark Scally could count on people shouting questions as they drove by his Oak Street home. The queries, Scally said, were always the same: What have you heard about the mill? Any buyers interested? That all changed Saturday morning, said the chairman of the Board of Selectmen. News of New Hampshire investor Cate Street Capital’s buying the East Millinocket and Millinocket paper mills in escrow late Friday as part of an undisclosed deal with present mills owner Brookfield Asset Management dawned over the Katahdin region as bright and clear Saturday as the sky overhead. Neighbors passed the news in the parking lot outside Lounsbury’s Shop & Save on Main Street and over the counter at Crandall’s Hardware next door. It was audible between guitar licks at Millinocket’s Trails End Festival and beers at the Blue Ox Saloon. As many as 250 people will be hired starting next week as the Cate Street subsidiary Great Northern Paper Co. LLC ramps up the East Millinocket mill to make an Oct. 30 delivery deadline of virgin newsprint for a European customer. Town and Cate Street officials have said the rehiring and restart would begin as soon as possible. Millinocket’s mill will restart in several months when market conditions permit, creating as many as 250 more jobs, Cate Street officials have said. Brookfield will remain the mills owner until the deal is finalized later this month. The closing in escrow allows Cate Street to operate the mills while the company awaits the transfer of environmental permits from Brookfield that legally cannot occur until Sept. 27. The in-escrow sale culminates a years-long effort that began with LePage’s predecessor, Gov. John Baldacci, and exhausted a dozen mill suitors before Cate Street appeared. As investors in alternative food, water and energy sources, Cate Street impressed Katahdin region officials wary and hardened by decades of diminishing forest products industry returns and outsiders’ attempts to start new businesses that eventually petered out or died stillborn after great promises had been made. Workers began applying for their former jobs on Thursday, said Louis Ouellette, president of United Steelworkers Union Local 152. Cate Street’s vision and drive, its alternative-energy portfolio and its plan invest $20 million to $25 million in the East Millinocket mill make it very different from Brookfield, Millinocket Town Manager Eugene Conlogue said. Helping establish Cate Street’s bona fides, officials said, is its acquisition two weeks ago of $275 million in financing for a proposed 75-megawatt biomass boiler in Berlin, N.H., and its years of success operating water purification businesses in the midwest. No one seems to expect a return to paper industry’s glory days, when the old Great Northern Paper Co. employed several thousand workers at top wages, but good management now could make the new GNP a cornerstone of the northern Maine economy.